Over the time, you write and save different files on your computer system. Initially, your hard disk is programmed to save data on it sequentially by default. 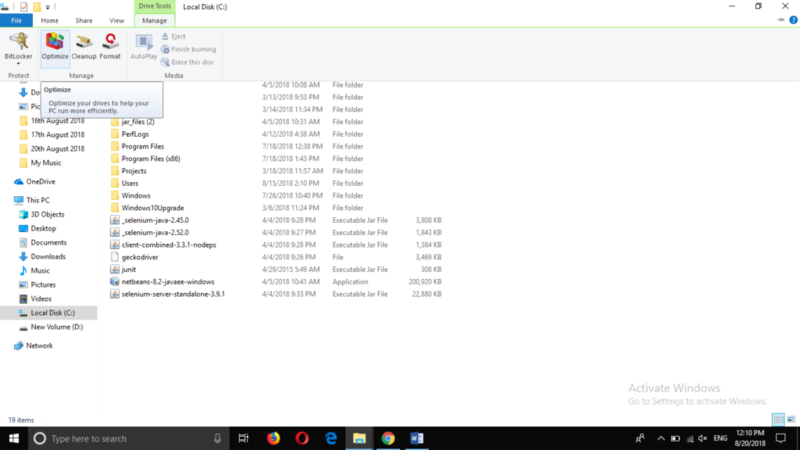 However, as you remove files from the hard disk by deleting them, the sequential arrangement of files get disturbed and certain gaps are created between different file locations. Sometimes, the new files are so small that they can easily fit into those gaps but at times, those files are too large that only a part of them can be saved in a gap. Such files are not saved completely on contiguous locations; rather different parts of these files are saved on multiple different locations. 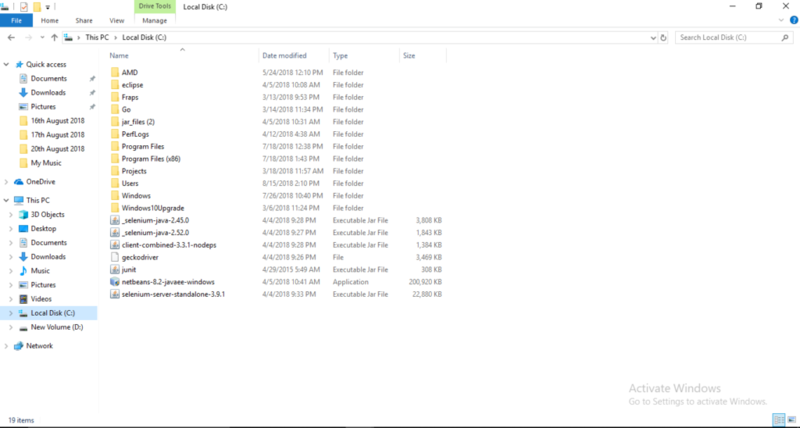 The scattered saving of these files is known as fragmentation. Fragmentation causes your computer system to slow down as it takes a lot of time in accessing the hardware multiple times in order to seek for different pieces of a file and then to fetch them. 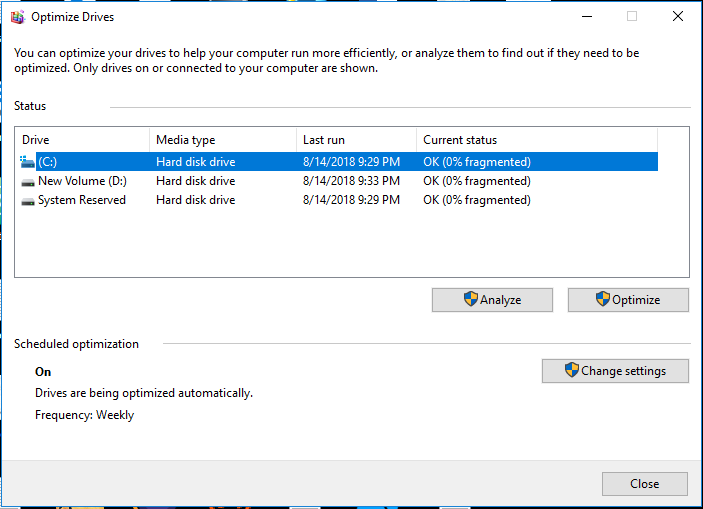 To stop this from happening, Windows 10 provides you with the Optimize Drives utility, which lets you defragment your hard disk drive. By defragmentation, it means to bring the scattered pieces of a file together and then save them at contiguous locations so that disk access time can be reduced. This makes your computer system performance efficient. 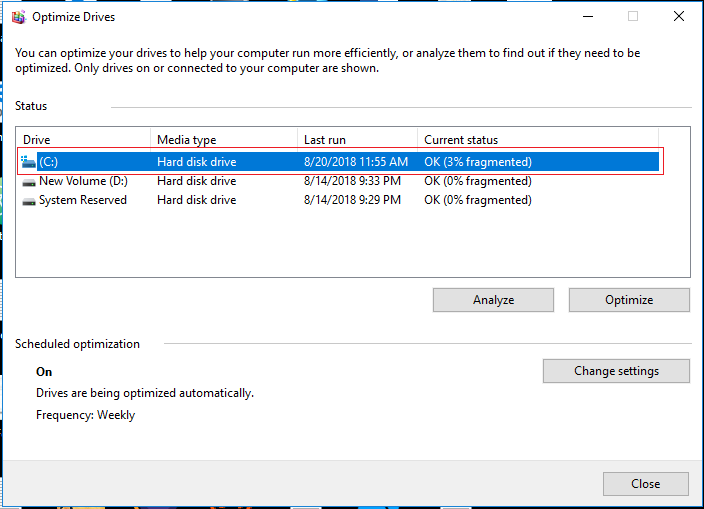 In this article, we will explain to you the methods through which you can defragment your hard disk drive using Windows 10. 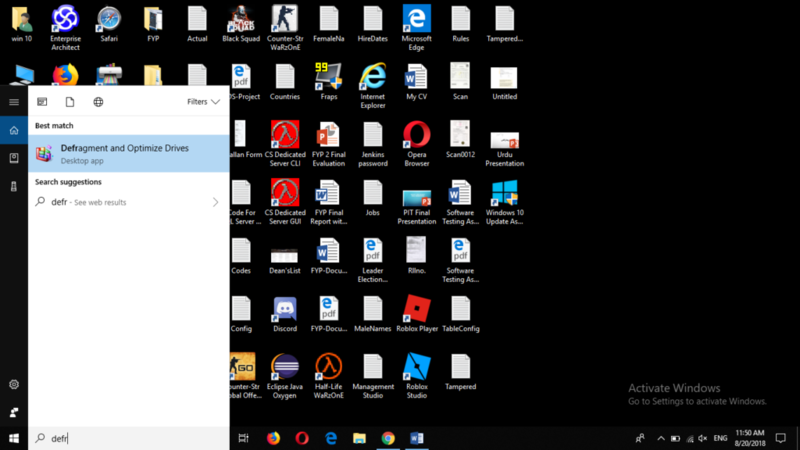 Type Defragment and Optimize Drives in the search section of your taskbar and click on the search results to launch the Optimize Drives utility window. Now you need to look at the current status. If it is set to Ok, it means that you do not have to defragment your hard disk drive because it is not that much fragmented that it can affect the performance of your computer system. After analysis or after the defragmentation, you can click on the Close button to close this window. 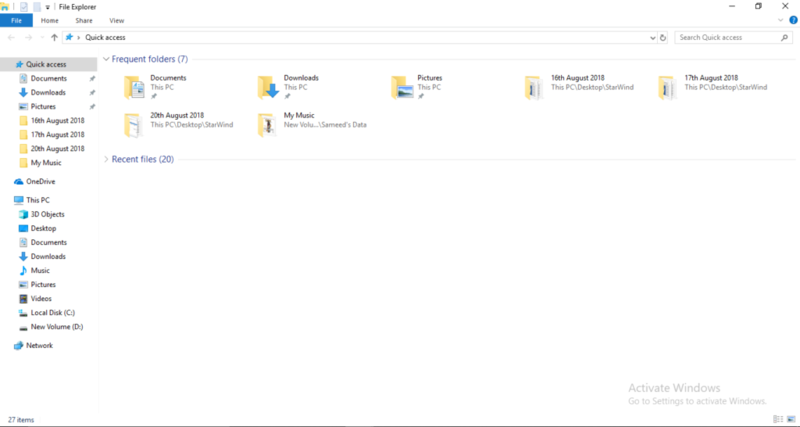 Type File Explorer in the search section of your taskbar and click on the search results to launch the file explorer window or click on the file explorer icon from the taskbar. Now click on the drive that you want to Optimize. In this case, I have clicked on the C drive. After opening this window, just follow the steps 3 to 5 of Method # 1. By following any of the two methods mentioned above, you can perform the defragmentation of your hard disk drive and optimize its performance. Usually, it is recommended that you should perform the defragmentation process every month. It is a common practice to defragment any drive when its percentage of fragmentation exceeds 10%. Unnecessary defragmentation can cause damage to your hard disk drive. 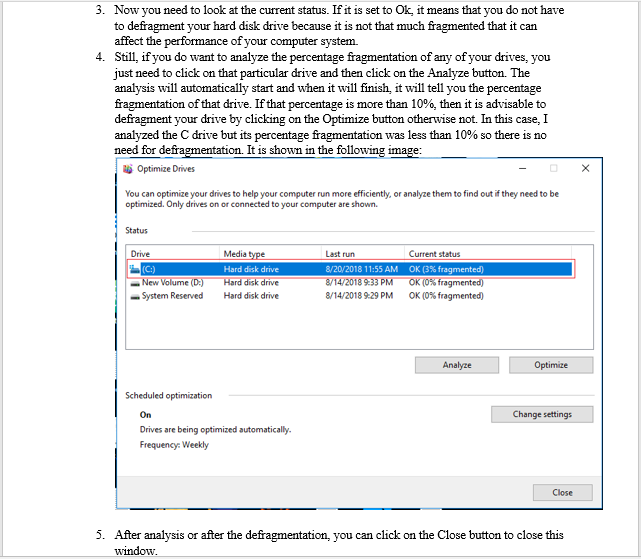 All you need to do is just to keep a check on the percentage fragmentation of your drives by using Optimize Drives utility and whenever you find this percentage crossing the threshold value of 10%, you can perform the defragmentation in order to improve the efficiency of your computer system.